Opposition legislators resigned on Tuesday to undercut President Gen. Pervez Musharraf's re-election bid, but the Pakistani leader pushed ahead with plans for an expected victory - naming a trusted ally to head the military in his place. Musharraf has enraged opponents by simultaneously serving as head of the army and president, and has promised to doff his uniform if he wins Saturday's vote by national and provincial lawmakers. Gen. Ashfaq Kayani, a former intelligence chief, will become vice chief of the army on Monday and will take the powerful top job when Musharraf vacates it, a military statement said. A Pakistani Cabinet minister, meanwhile, said top officials had agreed "in principle" to grant exiled former Prime Minister Benazir Bhutto amnesty from prosecution in pending corruption cases. Bhutto has held monthslong talks with Musharraf over a possible power-sharing agreement. Among her demands has been for longstanding graft cases against her and other politicians to be dropped. The parliamentary resignations are aimed at eroding the election's validity. 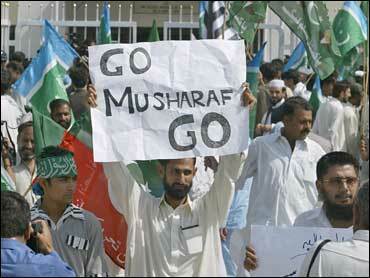 Musharraf's allies insist they have enough votes to win. The government said the resignations would have no effect on the balloting. Maulana Fazal-ur Rahman, leader of the opposition in Parliament, said Musharraf might win but would lack legitimacy. "After our resignation, Musharraf's success would have no value," Rahman said. Chaudhry Ameer Hussain, speaker of the National Assembly, parliament's lower house, refused to say when he might accept the resignations. Musharraf, who seized power in a 1999 coup, has faced growing opposition since March when he made a botched attempt to oust the country's chief justice. Lawyers for Musharraf's two main rivals in Saturday's vote - retired judge Wajihuddin Ahmed and Makhdoom Amin Fahim, vice chairman of Bhutto's party - filed two petitions with the Supreme Court on Tuesday morning. The court dismissed several similar challenges Friday, but lawyers hoped it would act after the commission changed an election rule in Musharraf's favor. Opposition leaders submitted the resignations of all 85 of their lawmakers in the 342-seat National Assembly. Two ruling party legislators also quit over their differences with their party's policies. "Our lawmakers are making this sacrifice in the larger interest of Pakistan. It is a decisive moment," said Javed Hashmi, acting leader of former Prime Minister Nawaz Sharif's Pakistan Muslim League-N party. The ruling Pakistan Muslim League-Q party hopes that Bhutto will not join the opposition boycott. Prodded by the United States, Musharraf has held talks with Bhutto that could lead to a power-sharing arrangement after parliamentary elections due by January. Bhutto told BBC America that she would accept U.S. assistance if Washington discovered the whereabouts of the al Qaeda leader, but that she would prefer to have the Pakistani military execute the strike.